Fish on a Friday for Seafood Week! It’s Seafood Week and of course here at BigFish Brand we’re ready to celebrate! One of our particular favourites for any #FishFriday is our delicious BigFish Brand salmon served with a portion of chips, some Lincolnshire peas and a healthy dollop of tartare sauce. 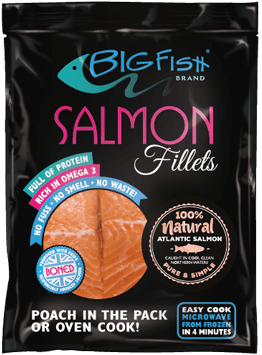 Rich in Omega3 and oven-cooked, so a little bit healthier than traditional fish and chips, but we think just as tasty! Check out the our serving suggestion here – and enjoy your Seafood Week!